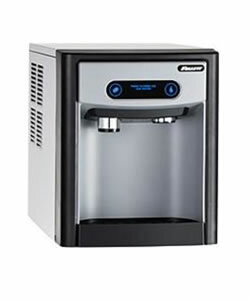 Sleek, attractive 7 Series and 15 Series ice and water dispensers have countertop and freestanding models. Additionally, the 7 Series is available in under counter models that can easily replace open bin under counter ice machines that require scooping by hand. All models have sanitary dispensing. These dispensers can produce 125 lbs of consumer-preferred Chewblet® ice per day. The 7 Series, which holds 7 lbs of ice storage, is ideal for a 25-30 person work group while the 15 Series holds 15 lbs of ice storage and is ideal for serving up to 50 people.